Both An Atlas of Impossible Longing and The Folded Earth figured in year-end book lists, in newspapers as well as blogs. 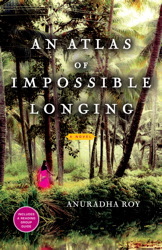 The Washington Post had An Atlas of Impossible Longing at number two in their Best Books of 2011, saying "In this sprawling epic set in 20th-century India, a single act of pity rattles down generations to break a caste’s rules, test a family’s mettle and throw together two unlikely childhood friends who will negotiate every circuit of human love"; it was also in the books of the year list of The Seattle Times ("In this richly imagined debut novel about three generations of a Bengali family set in early 20th-century India, we come to understand what it means to have a home and family and also to lose them and become fully free") and Huffington Post's Red Carpet Season for Books list. The Folded Earth was in The Business Standard's The Year in Books by columnist Nilanjana S. Roy: "One of the quieter and lovelier surprises of 2011 was Anuradha Roy’s The Folded Earth, set in Ranikhet, which updated the “plain tales of the hills” genre for our times." It was also at the top of the list in The Asian Age, which said: "This year we were spoilt for choice with regard to fiction. First-time as well as old and venerable authors gave us spectacular stories. The few that come immediately to mind were Anuradha Roy’s The Folded Earth, Julian Barne’s The Sense of an Ending, Joydeep Roy-Bhattacharya’s The Storyteller of Marrakesh, David Davidar’s Ithaca, Jeet Thayil’s Narcopolis and Jamil Ahmad’s The Wandering Falcon." Eleuthrophobia, an interesting literary website in the UK which I discovered recently, placed it at number 4 in its Books of the Year list and described it as "a book to clutch to your heart through the cold winter. It's a rich and evocative story of rural India's struggle to shake off the remnants of the Raj and embrace a new political and religious future." Hello, and congratulations on the Man Asian LitPrize longlisting! What a great achivement it is ! Your both novels become a part of world's noteble books. I have bought both of them and really eager to read.